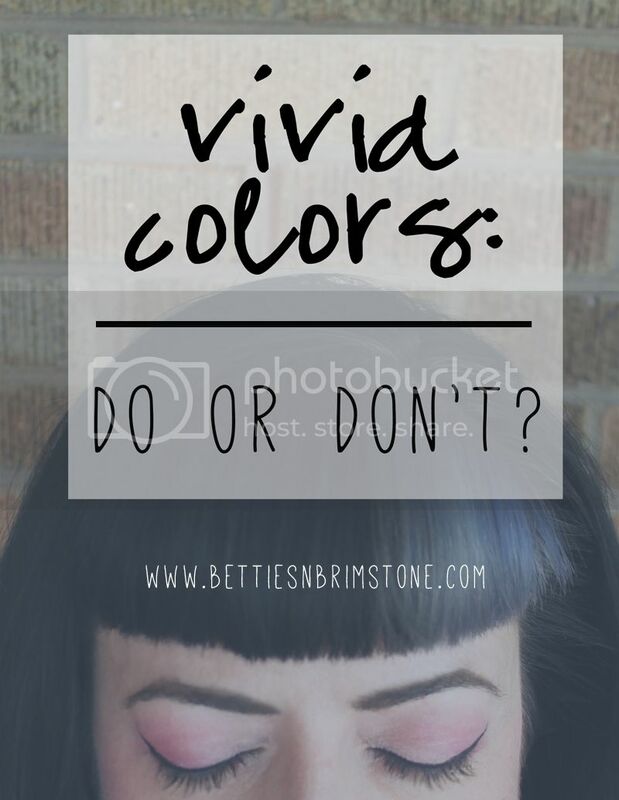 Betties N Brimstone: Are Vivid Hair Colors Right For You? I started out with blue, which made me feel like a total Wonder Woman superhero! 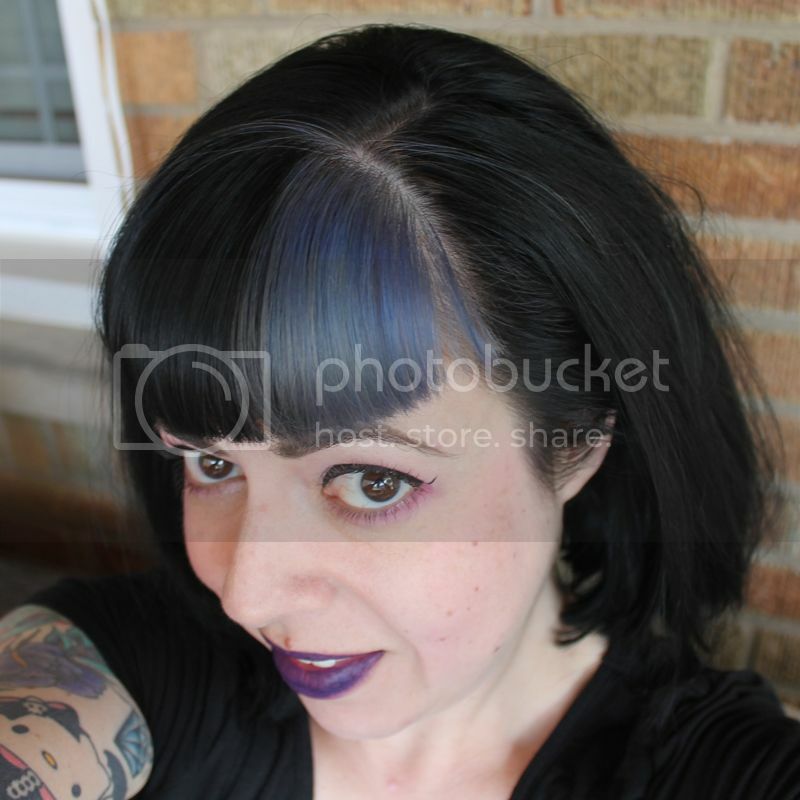 I had a short stint with red/pink (I hated how I felt like it limited my makeup options), but then jumped back to blue, and eventually went purple, which lasted for a really long time because I liked how it faded out the best. When I got tired of having purple for so long, I tried teal. The fade out was kind of green, not nearly as nice as the purple when it faded. I also had to custom mix my teal shade using green and blue dyes, where the purple was straight up from the tube. I always had my bleaching and initial dye done by a professional, but I would do the touch-ups on my own since it was needed so frequently! Then one day I just decided to wipe it out completely, to just go all-black. I would guess that it was about the time I started seeing more and more students with colorful hair. I got that weird self-conscious "am I too old for this?" feeling, but then it snowballed with a feeling that vivid hair was becoming so mainstream that it didn't feel special to me anymore. And it was (is) a LOT of work to maintain. It took me a long time to get the chunk of hair grown out enough to get it fairly blond, because I've been dyeing it black for so many years (my natural color is med-dark brown, by the way, so it's not too different). For a long time, I just had a shock of lighter blond/reddish hair (see here)! 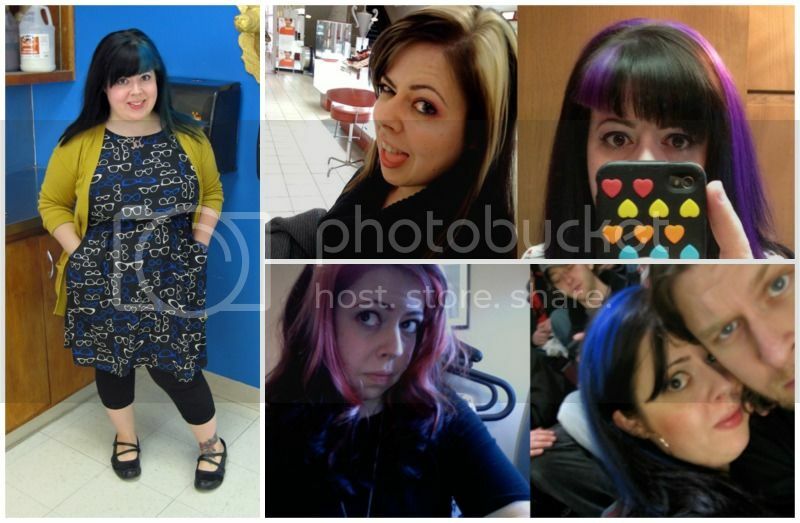 I've always kind of missed my vivid color a bit, but every time I thought about bringing it back, I would remind myself of how much of a hassle it is to maintain. Touch ups every 2-3 weeks! Washing in cold water! Washing my hair as little as possible... with my super sweaty roller derby practices in-between? Is that even possible? 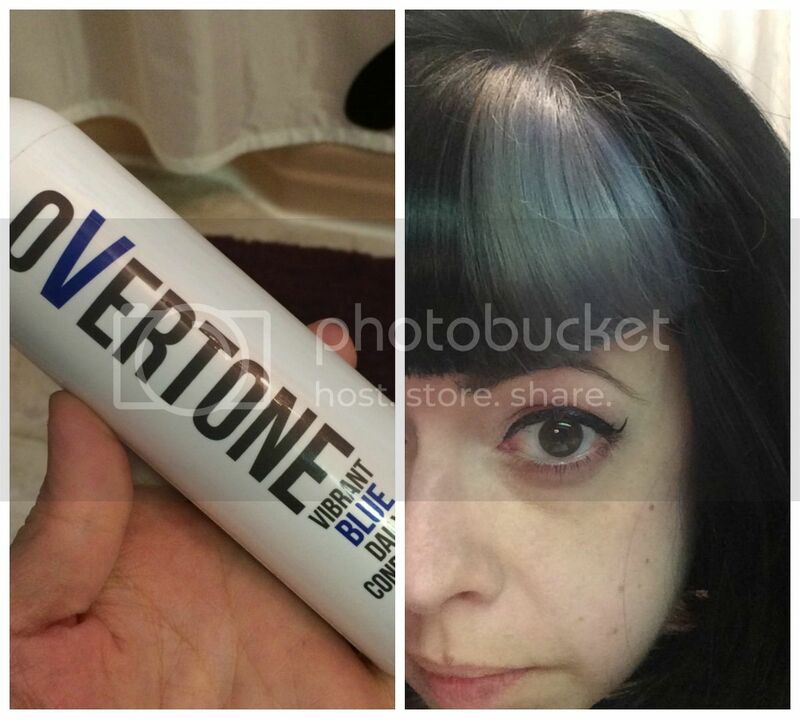 Overtone conditioner is basically conditioner with a little bit of vivid hair dye mixed in. It's designed for people that already have vivid color - to use to help prevent fading, but you can use it on any hair really, with varying results. 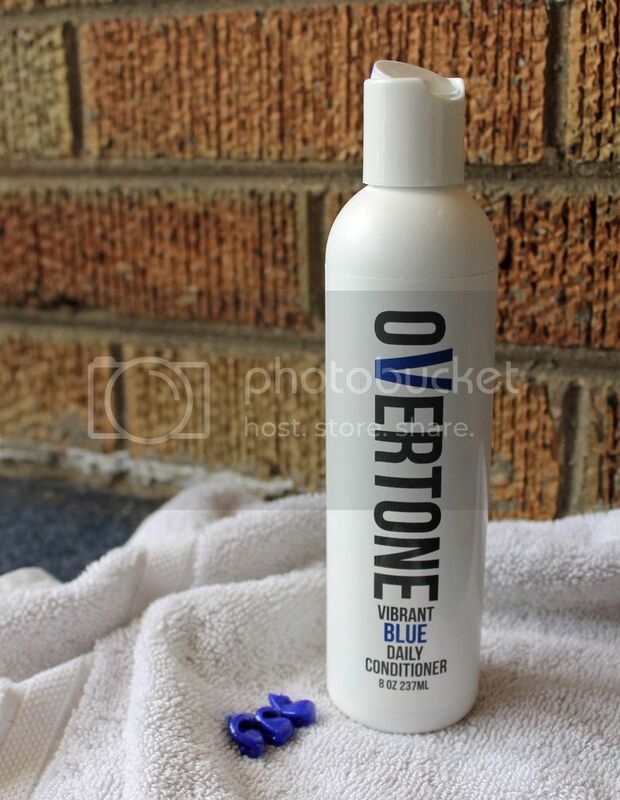 I remembered Natalie mentioning something on Facebook I think about how she uses Overtone to make her black hair even blacker, and I thought that this was kind of genius. I wanted to try it, but my blond swatch? It'd turn blue... ish. The more I thought about it, the more I actually liked the idea. It's pretty cool. I like that I'm not afraid to wash my hair because my hair will lighten. 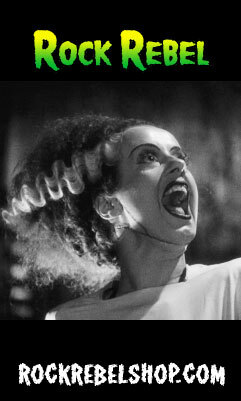 I also like not having to reserve a Friday night to staying in so that I can walk around the house with dye-encrusted hair for hours. 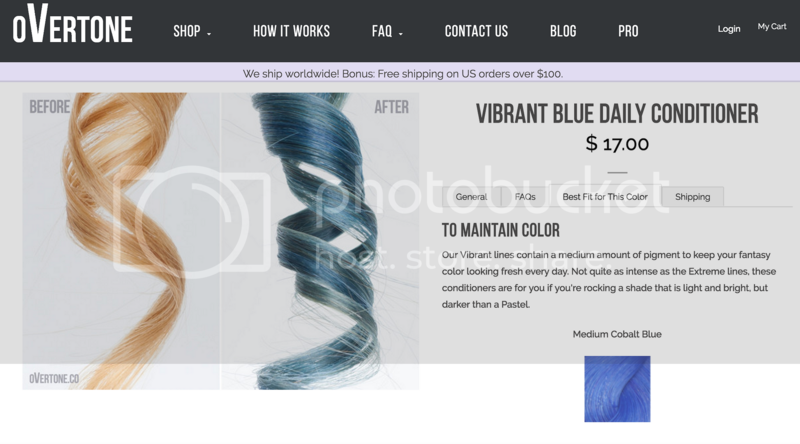 Is the color "vibrant" blue? No. I honestly was going for more of a pastel-y, grayish blue, so I'm super happy with the results. 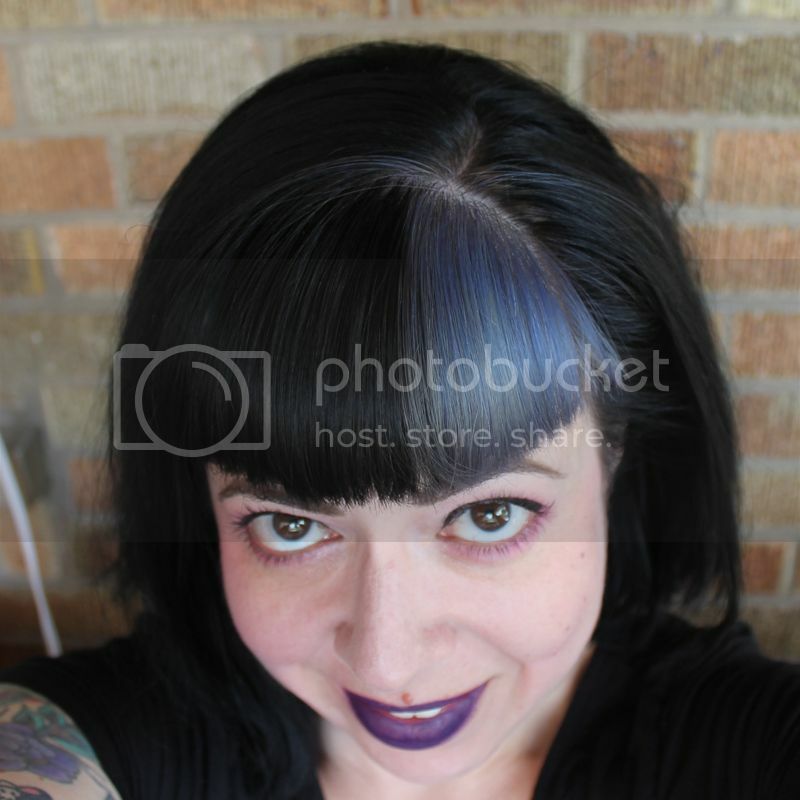 I checked the pastel blue on the website and I knew it wouldn't be dark enough (I figured my hair was like the medium swatches), so I bought the "vibrant," knowing that it would actually turn out lighter. So if your color seems to not be as saturated as you want after the very first wash, give it a couple of cycles because it'll change somewhat. Now, I suppose I could go to full vivid hair dye and just use Overtone as a maintenance solution between touch ups, but I like this kind of subtle look. I think I'll keep this up through the summer, but probably strip it back to blond before the school year starts. 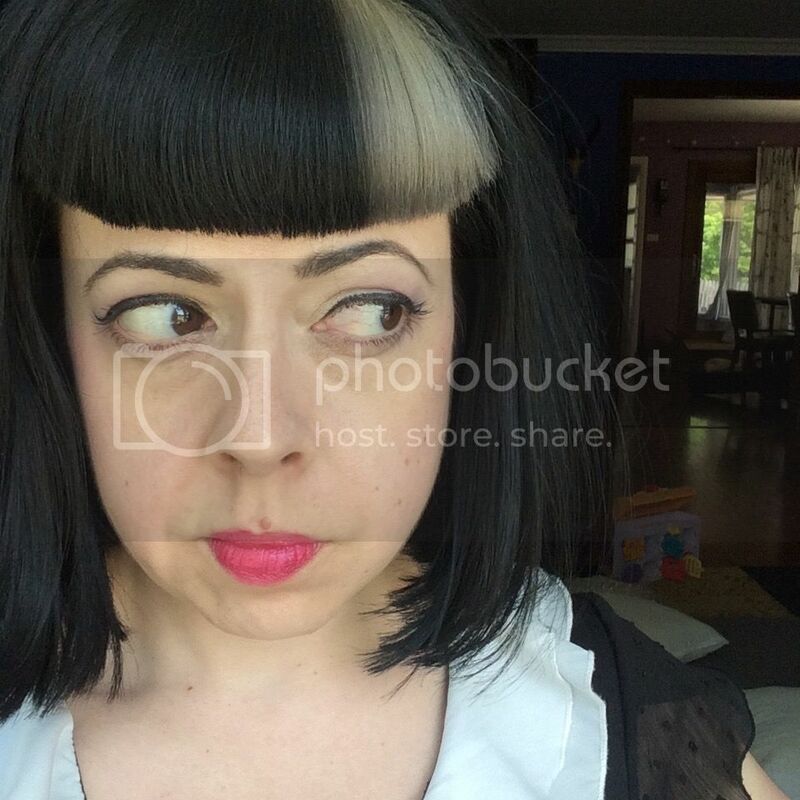 I like the contrast of the blond vs black, but this is a fun temporary summer option. 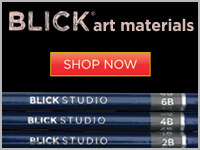 So, you now need to think: are vivid colors right for me? And if you're not ready for the full vivid commitment, how about something in-between, like Overtone as a temporary color option? 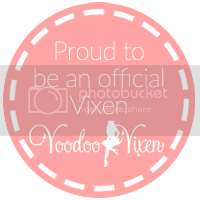 I can't decide for you, but I can share the experiences that I've had so that you can use them as a guide to make your own style choices. My best piece of advice would be that if you're thinking about it, and your employer won't fire you if you do it, then go ahead and take the leap! Hair grows. 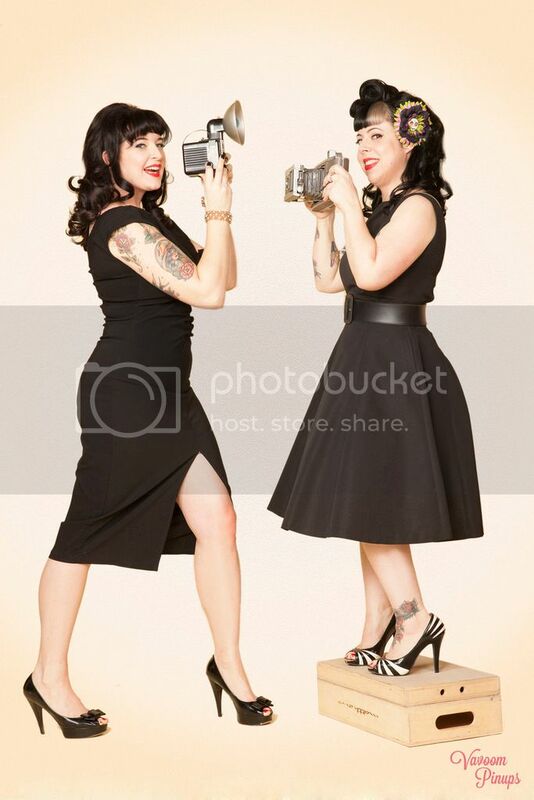 Life is too short to wonder what it would be like to have fun hair.